Amethyst is one of the prettiest gemstones on the planet; famous for it’s vibrant shades of purple that captures everyone’s attention. 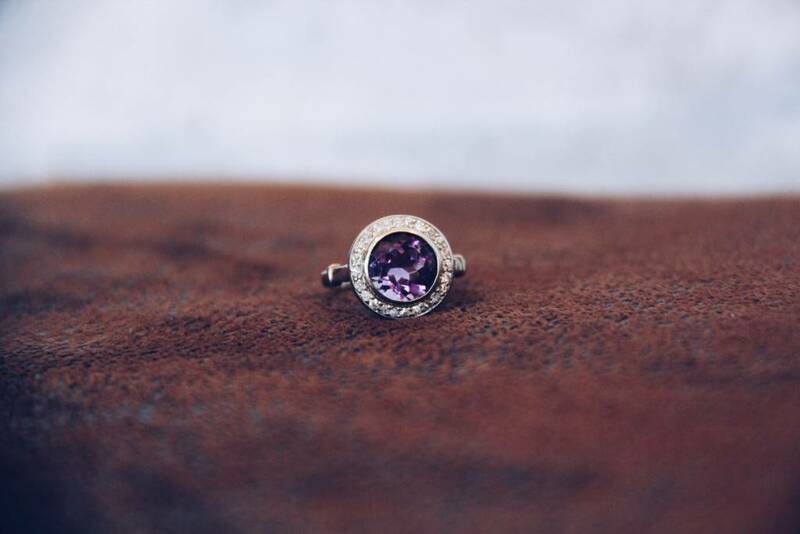 The color of the February birthstone is a deep and rich shade of purple that represented royalty and power back in the days of ancient kings and queens. Amethyst is a member of the quartz family and appears as purple quartz or crystals in clusters when discovered in its natural form. It is a beautiful gemstone whether it is a newly discovered gemstone inside a geode or one that has fashioned into a stunning ring. 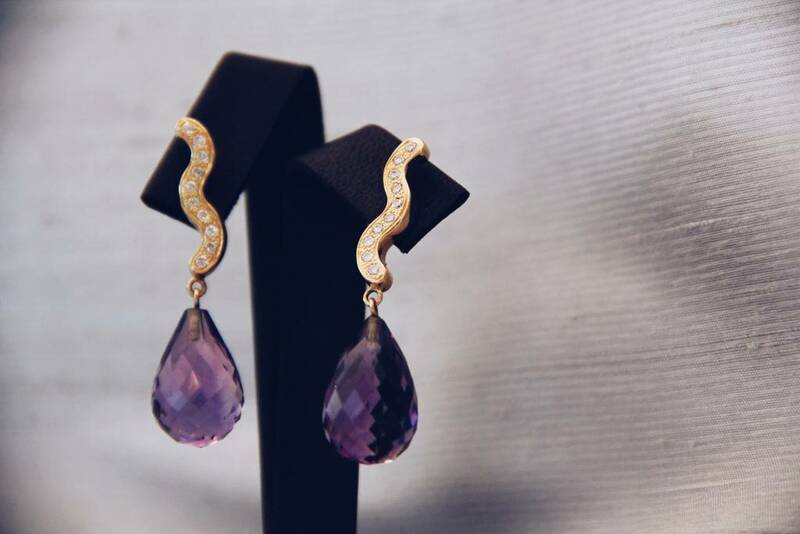 Amethysts are mysterious gemstones that can be found in various shades of purple. Gemologists and scientists are still at odds as to what exactly causes the different colors and shades of amethysts. Some believe that the different colors are due to the amounts of iron oxide and others the amount of manganese or even hydrocarbons. This secret has yet to be solved. The history behind the amethyst gemstone dates back to prehistoric days. Humans used the stone for decoration as was discovered by archeologists. It has also been noted that Cleopatra had a signature ring with an amethyst stone. Another historical figure that wore the amethyst is said to be Saint Valentine. Saint Valentine’s amethyst had an engraving of Cupid, who was his assistant. Amethyst was also a favorite stone of royalty from the days of pharaohs, kings and queens. The deep purple stone represented royalty and power. Some even believed the stone to possess “good” powers. Amethysts were believed to have certain healing powers, including the power to treat mental disorders. It was also believed that the gentle properties of the stone would also prevent drunkenness and was prevalent in the making of goblets for royalty to drink from. The goblets were adorned with amethysts to protect the one drinking from the cup from having too much wine. Amethyst was also thought to prevent headaches, hearing problems and to cure insomnia. Now that you know all about the amethyst and its history, let’s fast forward to the modern century. Today the amethyst gemstone is cherished and worn for its outstanding beauty. Amethysts were proclaimed as the official birthstone for the month of February in 1912 by the American National Association of Jewelers. The stone also represents the zodiac sign of Pisces. In addition to being February’s birthstone, amethysts are also the recommended gemstone to give as an anniversary gift for the 4th, 6th, and 17th wedding anniversary. Amethysts are ranked a number 7 on the Mohs scale for hardness, which makes it one of the more durable stones. Whether you are shopping for a nice amethyst birthstone ring for yourself or as a gift, we will be happy to assist you at Diamonds Forever. Call today and set up an appointment for personal assistance at 619-223-2151.